What is left of you when you are gone? What do you give off when you are here? 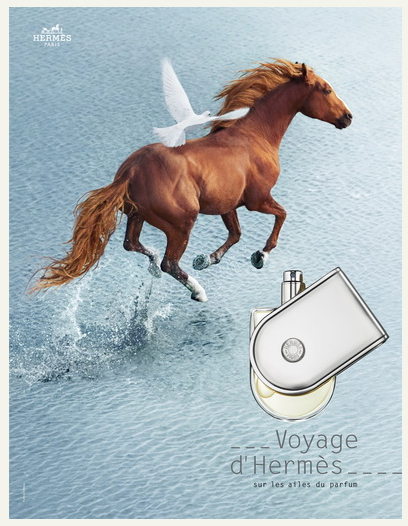 That’s the story behind Voyage d’Hermès, the latest perfume from a couture house built on the sensual mystery of exotic travels. The scratch-proof swivel closure is modelled after a travel magnifying glass, which means you don’t have to worry about errant caps that come off in the suitcase! The subtle citrusy fragrance is perfect for both men and women, starting with lively top notes to get you moving and then settling into a warm, woody caress to comfort nervous or frazzled travellers. He wanted the most beautiful of journeys, the one not yet undertaken. He hoped that people would smell the perfume and say, not: “It reminds me…” but: “It’s calling to me.” Going on a journey means going to another place. Wherever the wind leads us, where our heart takes us, where those we meet captivate and liberate us. Not knowing in advance. He had to avoid outlining a portrait of a man or a woman, of a town or a nature spot, of a moment or an era. But to create abstract art. A play on paradoxes. Complementary elements. No, this perfume would not smell of a kind of wood, a flower, a particular raw material, but of the unknown in all its glory. To express its nuances and unexpected pairings. Familiar, surprising. Energy, comfort. Masculine, feminine. An infectious mixing of genres. A woody fresh, musky fragrance. He would combine self-assurance with vivacity. This would be to the classic perfume bottle what the pocket magnifying glass was to the solid sort that lives in a desk, what a wristwatch is to a clock. It would open out at the touch of a finger, like pushing a door. It would turn on itself without going round. Not content with being merely mobile, it would be the incarnation of movement itself. Its material and colour would be aluminium, a material that reflects all others. Its contours would be those of a stirrup. Its axis a saddle tack. It would blend seamlessly with the hand. Would not be thrown away but kept. Refilled. And filled again. It would go away and stay on. Living a long time.